Tap Kanji by stroke count order. 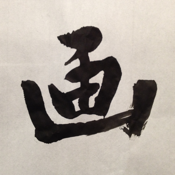 You might learn and memorize Kanji more by this app. 885 kanji is installed, all of 常用漢字(everyday use kanji), 人名漢字(name kanji), and 大字(complicated number kanji) from 1 stroke to 9 strokes. You can purchase English sub for Kanji in app (check third screenshot). For making the app more fun, number and complicated number kanji will show up more. Tapping wrong gets 10 sec. penalty. Kanji is based on Japanese.